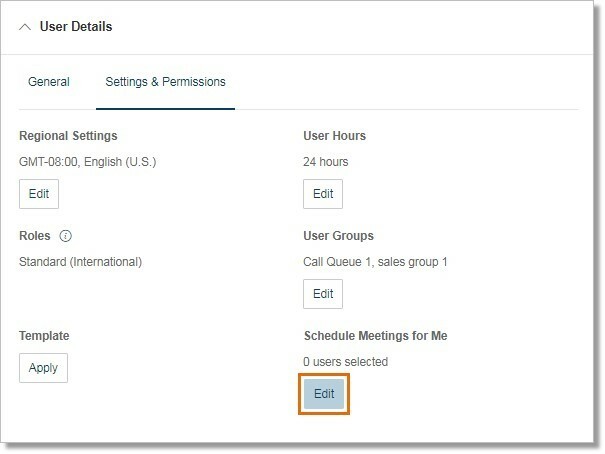 AT&T Office@Hand Meetings have the option to allow other Users to schedule a meeting on your behalf. For example, as an Administrator/manager, you can allow your secretary to schedule/organize meetings on your behalf. To use this feature, you must authorize another User first to schedule meetings for you. This can be done by logging into the AT&T Office@Hand Online account. Click Settings, and then click on your User Details. Extension before clicking on Settings > User Details. Account Administrators can also authorize for their Users who would want others to schedule meetings on behalf of them. Account Administrators can go via the Users tab, and then select the User. Click Edit under Schedule Meetings for Me. On the Schedule Meetings for Me window, tick on the checkbox of the User/s you want to grant permission to schedule meetings for you, and then click Save. User/s whom you have authorized can now schedule a meeting for you on AT&T Office@Hand Meetings. IMPORTANT: You and your authorized User/s should log in to AT&T Office@Hand Meetings at least once for seamless activation of the feature. Log in to AT&T Office@Hand Meetings. Click Advanced Options under Meeting Options. Click the Schedule for: checkbox, and select the original Host/User whom you are scheduling a meeting for. When Schedule for: checkbox is ticked and the original Host/User is selected, the topic will also change in favor of the selected original Host/User. Select your Calendar and click Schedule.